Using carefully selected combinations of metals, it is possible to etch intricate patterns onto a silicon surface, as shown above. Credit: Ref. 1 and licensed under CC BY 4.0 © 2016 L. Kong et al. Sing Yang Chiam at the A*STAR Institute of Materials Research and Engineering and his colleagues have now discovered the key governing mechanism by which MacEtch works. "We were very surprised by our discoveries," says Chiam. "Only after many repeated tests, and studying it from many angles, did we become convinced by our model." MacEtch is based on silicon's interaction with a catalyst (such as gold) in a hydrogen peroxide 'etching solution'. When coated on silicon, the catalyst accelerates hydrogen peroxide's attack on its surface. The process can be controlled, however, by putting certain blocking metals between the catalyst and the silicon. If this intermediate layer is placed in a dot pattern across the silicon, when the hydrogen peroxide is added, the silicon beneath the dots is protected from etching. 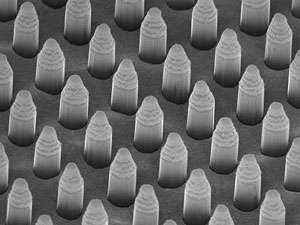 These protected points become silicon nanowires as the silicon around them is dissolved. Chiam and his team recently showed chromium metal is a good blocking layer. However, why chromium worked well, and what other metals might also perform well, was not known. "We set out to find the fundamental governing mechanism," Chiam says. "Then we could more easily determine whether one material should or shouldn't work." After systematically studying different blocking metals, the researchers soon overturned the prevailing idea the catalyst controls etching by helping inject positive charges at the catalyst/silicon interface. Instead, they showed etching is controlled by a chemical 'redox' reaction between the catalyst and the silicon. Only metals with a high enough redox potential can react with and remove silicon atoms. This discovery helps reconcile previous experimental discrepancies like the chromium result and means MacEtch catalysts or blocking materials can be chosen simply by looking up their redox potential. The team is already using its new understanding to produce even more finely detailed, more deeply etched silicon nanostructures, Chiam says. Applications range from filtration to microelectronics, he adds. "We look forward to finding the right partner in taking our discovery and technology forward."